From the signs of babes . . . The truth about our federal government's national debt. Hard to believe she can even afford a dollhouse. The Family Foundation consistently warned that government expansion of Medicaid would increase in demand and cost. But it is also clear now that government expansion of Medicaid is crowding-out charitable and nonprofit organizations currently providing the same service. As more Medicaid eligible patients register, the less patients that free and charitable clinics will have to serve. And without a steady number of patients to serve, free medical clinics will ultimately experience a decline in state and private funding. As promised, I wanted you to get the video LINK to The Family Foundation’s 2017 Gala program. If you weren’t there, bestselling author and radio commentator Eric Metaxes kept the attendees of the packed convention room hanging on his every word, and I wanted to make sure you had the chance to see it for yourself. And if you were with us that evening, you’re probably interested in watching it again. Either way, please SHARE THIS with your friends and family. You can watch it at your convenience HERE on our YouTube page. 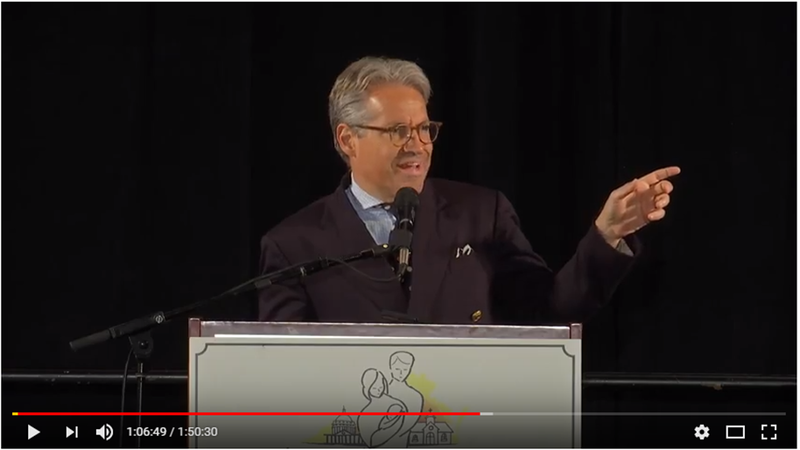 (Note: My speech begins at 29:48, and Eric’s speech begins at 1:03:02) Also check out our 3-minute promotional video first aired at the Gala, featuring the stories of three incredible Virginians. Metaxes released his latest book, Martin Luther, the same week as the Gala, so he gave us an inspiring message about the true story of one man who, by his bold courage and faith in God, changed the world forever. Eric Metaxes is the author of several other best-selling books, including Bonhoeffer: Pastor, Martyr, Prophet, Spy, If You Can Keep It, and Amazing Grace: William Wilberforce and the Heroic Campaign to End Slavery just to name a few. You will definitely be encouraged by his timely and insightful message to people of faith in an ever-darkening culture. I also want you to have the chance to hear from me as well, as I spoke about the value and importance of ordinary people “stepping up” in often small but hugely impactful ways. I also share my vision and sense of renewed purpose for The Family Foundation in the challenging years ahead. If you weren’t able to join us, you will definitely want to watch it now. I hope you will be enlightened, encouraged, and inspired by what you see and hear. Note to ACLU: Join Us! It’s good when organizations that often find themselves on opposite sides can work together. At The Family Foundation, we’ve sought opportunities to join coalitions of diverse groups on important issues that shouldn’t be partisan. That’s why we’ve worked with groups like the ACLU, Planned Parenthood and others on ending the shackling of pregnant prison inmates, and with similar coalitions on financial reparations for victims of eugenics, foster and kinship care issues and others. So we were thrilled the other day when we saw that the ACLU agrees with The Family Foundation when it comes to following laws regarding the creation and removal of regulations. You see, the federal government has to follow the federal Administrative Procedure Act and Virginia government has to follow the state Administrative Process Act. These laws, as boring and cumbersome as they are, ensure that presidents and governors – or the entities tasked with regulations – cannot act unfettered. It’s a rule of law thing. Recently we learned that the ACLU is suing President Trump for his decision to undo a requirement that religious entities pay for their employees’ birth control under the ACA. One of the arguments they are making is that the Trump administration violated the federal Administrative Procedure Act (APA) because they allege the interim rules were released without complying with the APA’s notice and public comment requirements. Coincidentally, that is exactly the argument being made by plaintiffs in a lawsuit against the McAuliffe administration, partially funded by The Family Foundation, after McAuliffe’s Board of Health failed to comply with the state’s APA on not just public comment requirements, but multiple other provisions as well, as it watered down health and safety standards for abortion centers. You see, following the law kinda matters, or at least it should. Yet, to this point, the ACLU of Virginia has been strangely silent on the McAuliffe administration’s blatant violation of the law, while the ACLU national headquarters has already filed suit against Trump – though whether or not the Trump administration actually did violate APA is a matter of great question. I’ll go on record now to say if President Trump violated the federal APA, his policy decision should be reversed and put through the proper legal channels. You see, it shouldn’t matter who the executive is or if you agree or disagree with the ultimate policy in question. The law should be followed to get to the desired end. Given the ACLU’s history of, well, let’s just say less than accurate legal arguments, I’m not super confident that their case against the President has merit, but time will tell. I can tell you that there is no question the McAuliffe administration violated the law, numerous times. So, it would seem, if the rule of law matters to the ACLU as much as they claim, they should be joining our lawsuit any day now.